Another in a series of posts from Neil about what the Brain Research can tell us about our faith and teaching. Colbert Nation fans will recognize the word “truthiness” from the cultural and political juggernaut which is Steven Colbert’s “Colbert Report” (one of my favorite shows). 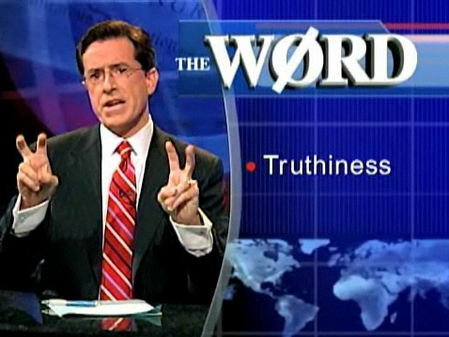 “Truthiness” is a quality characterizing a “truth” that a person claims to know intuitively “from the gut” or because it “feels right” without regard to evidence, logic, intellectual examination, or facts. And the research says our gut response is impacted by visual images. Faith could be a synonym for “truthiness”. Hebrews 11 suggests as much. Faith is a visceral feeling of the truth of something. And if images convey a truth beyond words, as the research indicates, then it comes as no surprise that God has put the IMAGE of the CROSS and Empty Tomb at the center of his truth. They are indelible visuals that almost need no words, or are too deep for words. 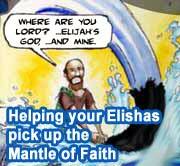 They explain the heart of God in a dramatic scene that defies logic. On sight, they evoke response before our intellectual neurons even have a chance. Once again, the Brain research illuminates the importance of using VISUAL-MEDIA in our teaching and worship, and the central importance of story. It’s not because we need to be “entertained”. It’s because God built us this way. Multi-media software, media-infused teaching for our kids, and media in our worship should be the norm, not the exception. Properly used, visuals IMPROVE the reception, perception, and memory of the message. Images not only impact our perception of the truth of what’s being taught, but as the research below points out, images make the storage/retrieval of memories much easier. VISceral and VISual share “vis” -which is the Indo-European root meaning “power, life, light”. The Greeks picked it up as “phos” (same them together: vis, fis, phos). The Romans coined the word “VIdeo” …meaning visual, -something you could see. “VISceral” in antiquity, referred to your inner “gut” feeling, -your inner sense of “truthiness”. When Jesus said he was the “Light of the World” he was speaking not just to the metaphor of illumination, but of power, life. Jesus is “THE VIS” of the World. Jesus is the VIDEO, the VISUAL. The image of God. The PHOS of God. Jesus is Truth…THE INSIGHT. The research cuts both ways. It tells us that visual images can also sway us in the WRONG direction. Take for example, the visual image of your typical boring Sunday School classroom, or a dour teacher seat in a folding chair, or a half-dead-looking preacher. Consider how your front door and sanctuary looks, especially to the seeker. They are sending messages that sway the validity of what you will also say. And don’t stop there! Consider how it smells -because the brain research also tells us that smells evoke visual and emotional memories. In our new church here in Florida, we meet in a conference room that has three large projection screens –which make up for the lack of “sanctuary-like” surroundings. The visual images displayed throughout the service are often startling, frequently beautiful, and rarely detracting. Last Sunday, they brought in a bread-machine to bake the communion bread just before the service. They get it. Across all the experiments, the findings fit with the idea that images help people conjure up images and ideas about the claim more easily than if the claim appeared by itself. “We know that when it’s easy for people to bring information to mind, it ‘feels’ right,” said Newman. Newman EJ et al (2012). Nonprobative photographs (or words) inflate truthiness. Psychonomic Bulletin & Review; DOI 10.3758/s13423-012-0292-0. Quoted from http://www.springer.com, the bulletin’s publisher. Neil’s main ministry is developing software for Christian education. Why does he do it? Because of the research and the experience! This entry was posted in Neil's "Brain" Articles. Bookmark the permalink.